The kind of deal Rangel is talking about is unlikely to address Salmon’s concern that government spending is excessive and government itself is too large. Rep. Salmon explains that his first allegiance is to the Constitution and to the American people, not to his political party. More importantly, he is not going to succumb to the Left’s bullying. To be clear, he will have many critics, on both the Right and the Left. President Obama wants Republicans to run away from their conservative base because it will enable Washington to take leaps and bounds to the Left. Enough is enough. Kudos to Rep. Salmon for taking a principled stand for the good of the country. His conservative colleagues in Congress should do the same. 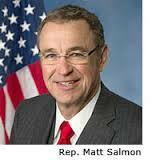 Tags: The Salmon Rule, Rep. Matt Salmon, Republican, Arizona, conservative discipline on bills, off-setting spending cuts, majority GOP Caucus approval before bill presneted, To share or post to your site, click on "Post Link". Please mention / link to the ARRA News Service. Thanks!